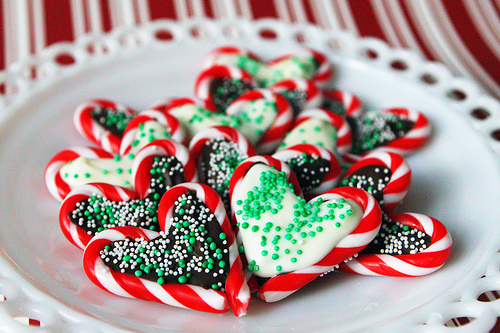 These candy cane Christmas hearts make a great edible gift or weekend project to make with the kids! This is a fun project to make with children, and the children can decorate and personalize the hearts with their choice of sprinkles. Of course, the cherry on top is the fun of eating them after! Line a cookie sheet with wax paper or similar liner to prevent sticking. Arrange the candy canes on the sheet, pairing them up to make hearts. Melt the chocolate in separate bowls. This can be done in the microwave (on a low setting or in short intervals) or in a double boiler (bain-marie). Fill each candy cane heart with melted chocolate, if you want to use both chocolates for each heart add one chocolate, let it cool, then add the other. Top with sprinkles. Place the baking sheet in the fridge or in a cool place to cool. Once they are cool remove the hearts and store in an air tight container. That’s it! This treat can make great token gifts for teachers, classmates, neighbors or other acquaintances!